A cloudy day, mild mountain air, and big bowls full of berries from our front yard. Sundays at our house are perfect for pancakes. We're especially lazy on Sundays, and we sit around eating these and reading and sipping coffee all morning. Then maybe we'll decide to put some clothes on, go for a walk, or take a drive our to a swimming hole. Or not. Growing up, Logan used to eat pancakes almost every day for months. His dad, Tim, would go through breakfast phases where he would make the same thing for weeks and weeks. Sometimes oatmeal, sometimes cereal, sometimes pancakes. Logan tells me that his dad used to wake up at the crack of dawn with tons of energy, and would sing made-up songs really loud until he and his sister were awake. Tim's soft, doughy pancakes became one of Logan's favorite things. His dad would stick extra ones in the freezer and throw them in the toaster on days when there wasn't much time to go out the door. I have very fond memories of pancakes, as well. Saturday mornings, my mom and I would get up -- dad had already started a pot of coffee and his first round of vacuuming the house -- and chat, choosing what flours we wanted in the pancake batter. My mother would gently pour a half cup of this, a quarter cup of that into our blue glass mixing bowl, each flour tufting down on top of the other. Every time the mix was a little bit different. She is a lover of teff flour, so that almost always got thrown in the mix. Each of us would take turns flipping pancakes, one flipping while the other read the paper. Pancakes always took hours to make, and hours to eat. My brothers, mom, dad and I would sit around the island in the middle of our kitchen, sipping OJ and milky coffee, eating pancake after pancake, chatting about religion and history, films and dreams and ambitions. Logan and I used to argue about what type of pancake is better. He likes his pancakes super flat and soft, with an almost uncooked center. I like them to puff up and crisp around the edges, so I get a crunchy bite when I dig in. We made pancakes together a lot when we first started dating. If only you could have seen how wide his eyes got when I put LOTS of oil in our cooking pan pre-fry. The thought makes me laugh even now. Our compromise is flat, reasonably well-cooked, with crispy edges -- the edges have grown on him I think. These pancakes are essentially the same as those pancakes I learned to make around that island in my parents' kitchen. They fry up just like normal pancakes, which, I have to say, makes me enormously giddy. I've had many a pancake disaster in my time, chaotic mornings of throwing different flours into a bowl with soy milk and apple sauce and banana hoping for the best. Tears were shed. Batches were reluctantly eaten, smothered in maple syrup to make up for their ugliness and undercookedness. When we were vegan, I insisted on using xanthan gum and the like to make pancakes. That worked just fine, until I realized what xanthan gum is. Xanthan gum is a less than ideal binder. It basically creates a slippery-slick environment in your colon while suppressing the microvilli that helps us to digest nutrients. NOT COOL. I have since ditched the x. gum, favoring flax, chia, or eggs to create a binding. These pancakes are gluten free, a bit more dense than your average variety. I chose not to add starch to this recipe. I am just kind of over adding excess starch to things right now. I just want the good stuff. I don't think that's too much to ask. We used a really bitter chocolate from Costa Rica (by Potomac Chocolate). Actually, it is so bitter/intense we couldn't eat it and enjoy it on its own. Otherwise I would never have used such an expensive bar in pancakes! But the intensity of this chocolate worked well when these cakes cooked up, especially after we doused them in maple syrup and honey. I enjoyed the bitter complex chocolate playing against the sweet, fluffy cakes. Yuuummmmm. In a large bowl combine buckwheat flour, garbanzo lava bean flour, teff flour, sea salt, baking powder, and chopped chocolate. Add coconut oil, honey, and egg, stir to lightly combine. Add water, vinegar, and mulberries. Preheat a skillet or griddle to 300 degrees, giving it a good 10 minutes to fully warm up. Ladle batter onto skillet to cook, making 4 to 5 inch round pancakes. When all of the bubbles have popped in the center of the pancake and the edges are slightly dry, flip and cook the other side. Cook for a minute or two on this side. To check for doneness, I usually flip the pancake over and slice into the bottom, checking for a liquid batter center. Of course, you may only need to do this once or twice with the first round of pancakes. Once done, plate and serve! 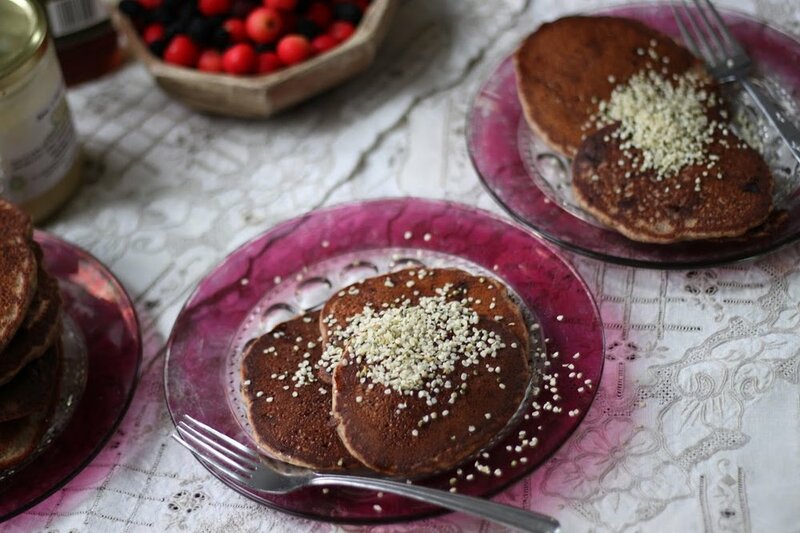 These pancakes are super filling and especially tasty topped with extra coconut oil, honey, and a mash of berries & sugar. I add hemp to most meals now, so I topped mine with hemp hearts.